I will post for my class, and then I will go home. At home, I will write my letter of recommendation and read Mignolo. I will return to campus early to deliver the letter, and I will clear up matters around the office, particularly with regard to grading papers. I will create a format for a midterm and write a draft of it. I will revise the syllabus for my other class. All of these things, I will do before I do anything else … except housework, of course, which I will do in between things. Then I will work on my article. If this weekend I do little beyond this, ce sera déjà tellement. Quand on a la vie et la jeunesse, c’est déjà tellement! Resistance is no longer an option, it is a necessity. That is the last line of a very good essay you should read slowly. Filed under Movement, What Is A Scholar? I took this with my phone in Oaxaca de Juárez on 26 October 2013. 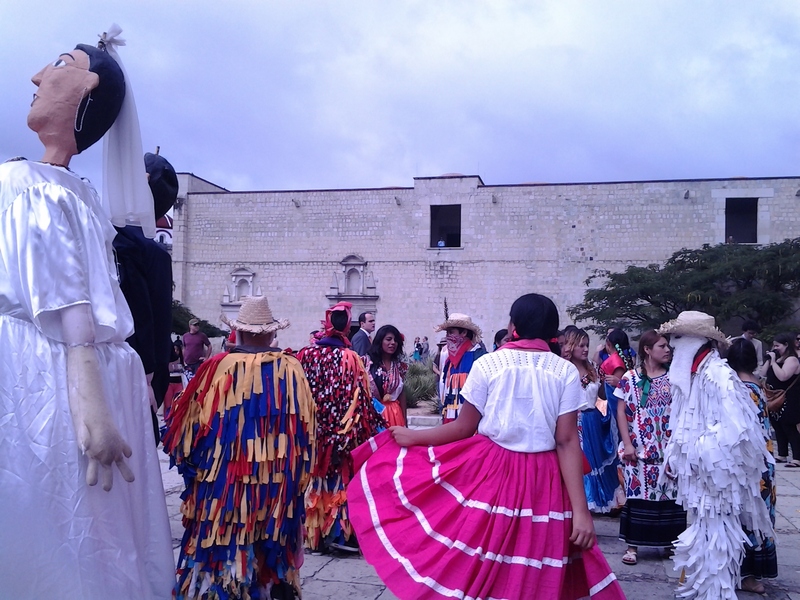 It is part of a wedding parade, outside the amazing Templo de Santo Domingo. I am interested in the clown costumes, which resemble those used in Cajun Mardi Gras; the clowns act in a similar way. Apparently these clowns also appear in rural Carnaval in Oaxaca, where they wield whips against their minions, as happens also in some towns in South Louisiana. I have heard that the Oaxacan clowns are inspired in masked African deities whose clothes also involve a lot of fringes. They do seem to have the personality of Exú/Elegguá/Legba. Science is finished, said the scientist I talked to today. The word implies critique, but it is now taken to mean production and profit. Science not oriented in those directions will not be done again. This makes teaching very painful, he said. Students go into biology because they know they can make things to sell. They have seen forensics shows on television. They want to isolate pieces of the “genome,” for example, to sell. I have decided one really does need a PowerPoint or some sort of visual aid on a projector. That cannot be misused, of course, but it is a good idea. One should read the abstract and explain it, and then on the PowerPoint have an outline of the paper, with a few quotations and images, that one talks through. Today I read a paper, which I do not normally do because I am usually not finished. I wanted to be finished, and I also wanted to have a text I could work with to judge time exactly … and I was not sure technology would work, so I did not plan to project anything on the wall. But the papers that communicated best, were of course not read, and they had well-used PowerPoints. The most interesting paper today was from a biologist, on how a genome project in Mexico, funded by Coca-Cola, is isolating a (single) Native American gene that would, putatively, be particularly vulnerable to diabetes. Otro tema que el estudio del FCCT revela es la pérdida de solidaridad entre colegas y el surgimiento del individualismo como valor dominante entre los investigadores. Esto se debe en buena medida a la exacerbación del elitismo y del sentido de privilegio particularmente en las universidades con la aceptación de puntismo, que ha generado una perversión en el trabajo académico. Es el triunfo cultural de la derecha en las universidades, que paradójicamente se expresa en la subordinación de la calidad del trabajo académico a los criterios cuantitativos de evaluación. From La Jornada; read the whole thing. Filed under Movement, News, What Is A Scholar?